Residences By The Lake. 167 Townhomes, 18 Live/work residences. FRAM Developments' luxury Port Credit Village Townhomes have made quite the name for themselves. They were recognized as "Project of the Year" by the Greater Toronto and Ontario Home Builders' Association for high design standards and enhanced lifestyle. Their ideal location, east of Hurontario, south of Lakeshore, puts all the wonders of Port Credit Village at your doorstep. This lively neighbourhood boasts a variety of restaurants, pubs and bars, something for everyone. There is TEN, Jam Martini Bar, Colossus, Snug Harbour by the Lake, and Starbuck's Chalet, to name a few. Port Credit village also boasts unique antiques shops, boutiques, and charming store fronts all along Lakeshore. Take a walk along Port Credit's historic streets and enjoy the healthy, relaxing, waterfront lifestyle that has made it so popular. Port Credit is approximately 20 minutes by Go Train to the downtown core, or 20 minutes via QEW/Gardiner Expressway in medium traffic. Buses and streetcar access to downtown are another alternative. Port Credit is fast becoming the trendiest new neighbourhood to live in!! Towns by the water, on the ravine, the mews and on Compassway. Great opportunity for live work units as well. 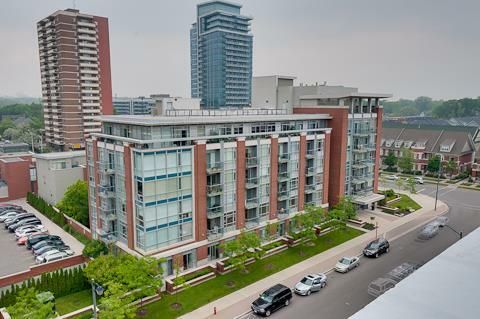 Located on the shores of historic Port Credit Village you will find the 3 popular FRAM condominium buildings that define luxury waterfront living in Mississauga. They feature a variety of suites, with some trendy 2 storey loft units as well as some convenient live-work spaces. 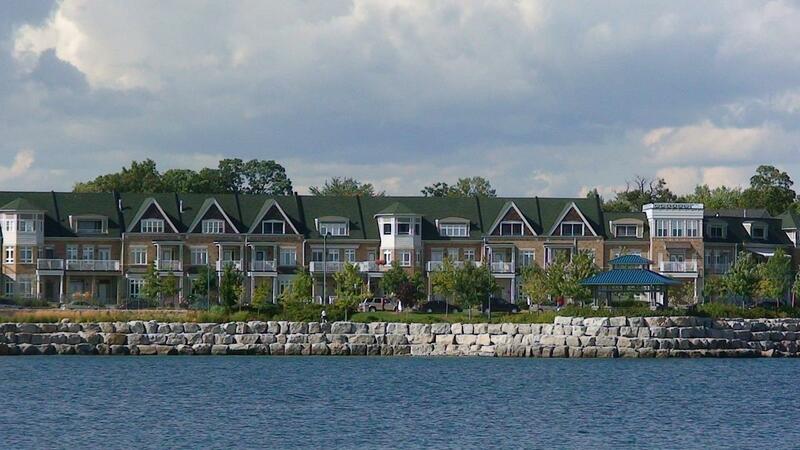 65 Port St., or the Regatta, is located on the boardwalk at the southwest corner of Hurontario and Port St. East. 70 and 80 Port St. East are across the street from the Regatta, and just steps from the lake and waterfront trails. Port Credit hosts several wonderful festivals throughout the year including a very large South Side Shuffle Jazz Festival in September and The Great Ontario Salmon Derby in July. All along the waterfront you will find lovely parkettes with special areas for rollerblading and skateboarding; as well as extra-wide bike and jogging paths. Port Credit is approximately 20 minutes by Go Train into downtown, or 20 minutes via QEW/Gardiner Expressway in medium traffic. Buses and streetcar access to downtown are another alternative. Port Credit is fast becoming the trendiest new neighbourhood to live in!! The next phase of FRAM’s award winning Port Credit Village community, North Shore offers elegant waterfront living in a well-established village setting, where amenities are all within easy walking distance. 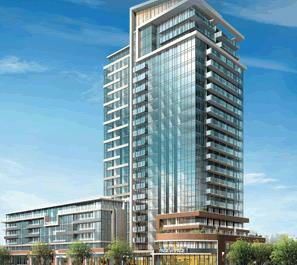 Conveniently located at the northeast corner of Hurontario St. and Lakeshore Rd., this contemporary 2-tower, glass and concrete structure is one of Mississauga's finest waterfront landmarks. The building features a 22 storey tower and a separate 6 storey low-rise building that offers retirement services with street-level public shops. Building Amenities include a state of the art Fitness Centre, 2 private lounges, 24hr concierge, dining room with a chef’s kitchen, a party room featuring a fireplace and full-size bar that spills out onto the large ground level outdoor courtyard and a sixth-floor rooftop garden. Currently the building has NO Pet Restrictions. Suites feature open-concept designs with 9 foot ceilings — 10 feet in the penthouse units on the top three floors — full-height, wall-to-wall windows, and large balconies or terraces. There are both open or enclosed kitchens, and in many models, master bedrooms with ensuite bathrooms and walk-in closets. Some two-bedroom layouts will feature breakfast nooks and split bedroom designs, with suites ranging in size from 795 SF – 2,282 SF. Granite countertops, oak hardwood floors and stainless-steel appliances and frameless glass showers are among the standard finishes. All suites also come with parking and your own storage locker. Call today about leases and units for sale. Floor plans available.